US clothes dryers use around 1,000 kilowatt hours of electricity a year per household. That's close to 4% of the 11,000 kilowatt hours of electricity used per year by most households. Therefore, if we all start using clotheslines, it will be like turning off about 4% of the power plants that are needed to produce energy for US households. Plus, this does not include the additional impact of homes that use natural gas dryers! 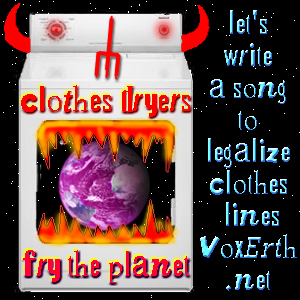 Come do the Clothesline dance and singalong with Stele *XOEarth Man* on the mall in Boulder twice a month. 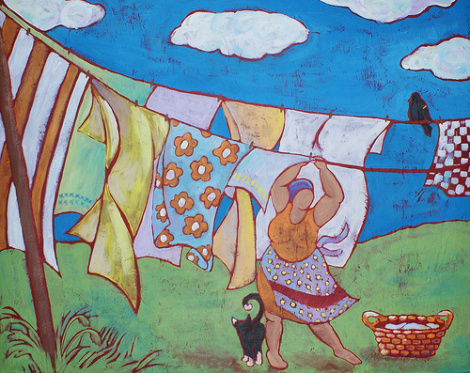 It's a little celebration of the clothesline's power to protect our air, water and land. Bring some clothes to hang - and clothespins if you have some. We will supply the clothesline and some clothespins. I would like to write a special clothesline dance song too. Who wants to help with this one? Thanks to Greg Miller and Valerie Stuart for help on this song. If you love somebody, put your love on the line. Via Greg in Boulder: I opted for no dryer at all. They’re energy hogs. My drying racks/clothesline have performed perfectly with no problems nor energy usage for 14 years now. Clothes won’t wash themselves but they will dry themselves… especially in this climate. They also put humidity in the house in the winter and on my deck in the summer how cool to have your clothes dry by the Sun… Starlight!!! Certain “conveniences” like dryers and garbage disposals (compost instead) we can do without. Via Harry Albert:: Small heaters generally have a fan-only (no heat) setting, which I find greener and quite helpful for stirring moist air away from clothes hanging indoors. The fan uses far less energy than the heater function does. And because my shower area has its windows shut for winter (covered with bubble wrap) I find it useful, after using the shower, to run the little heater on fan-only in that room to dry out the shower stall and hanging towel so at to avoid mildew/mold.. a few hours suffices. Recipe for stowable indoor clothesline: two small screw-eyes. Two small ess-hooks (shaped like letter S.) A length of kite string (Into the Wind has nice dacron, which is PET). Optionally squeeze one end of each S into a closed loop. Install the screw eyes in wooden trim (they would pull out of drywall).. driving in a nail then pulling it out will make a starter hole for a screw eye. Tie the string to the closed-loops of the ess hooks so that the open ends of the hooks can clip into the screw eyes and hold the string tight. When not in use, clothes line can be unhooked at one end and that ess hung on the other eye, or unhooked at both ends and stowed elsewhere. Hanging Out Day: …Project Laundry List’s efforts on April 19th to educate communities about energy consumption, “Right to Dry” legislation, and most importantly, how to save money and energy by utilizing a clothesline. Hanging Out Day is [a day] that individuals hang their clothes on a clothesline, with messages on sheets or T-shirts so that everyone will see them, and discuss your statement. We've started a Love on the Line campaign in Boulder for Earth Month 2016 ….to spread by each of us turning someone onto hanging their clothes out!. Our C3 Culture Climate Collaboration meeting with you, me and a group of inspired people got it going. Anyone can join the campaign and share ideas … like posting hanging clothes photos on Facebook, in Laundromats, etc. Treehugger excerpt: Hanging laundry has many benefits. You don’t have to use the dryer, which saves significantly on electricity. It keeps clothes in much better condition. Think about the lint trap; that’s really just bits of your clothing, which weaken with every drying session. Better to treat them kindly by hanging to dry. They will last longer. You'd see the "company table cloths", With intricate designs. Now what goes on inside a home, Is anybody's guess! 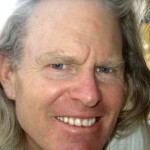 Alexander Lee founded Project Laundry List as a Middlebury College undergrad in 1995, after hearing Dr. Helen Caldicott say we could shut down the nuclear industry if we all did things like hang out our clothes. He’s been true to the cause ever since, pushing for clotheslines across the land — even at the White House. Grist caught up with him to find out how hanging out can make for better neighborhoods, what clotheslines have to do with climate change, and why laundry stigmas are as persistent as wine stains. 10) Save money :: You can save more than $25/month off the monthly electric bill for many households. 9) Clothes last longer :: Where do you think lint comes from? 7) Saves Energy, Preserves Environment, Reduces Pollution :: Conserve energy and the environment, while reducing climate change. Learn how! 6) Healthy Work :: It is moderate physical activity which you can do in or outside. You can even lose weight! 5) Get the Sunshine Treatment :: Sunlight bleaches and disinfects. 4) Replace another appliance :: Indoor racks can humidify in dry winter weather. 3) Avoid a Fire :: Clothes dryer and washing machine fires account for about 17,700 structure fires, 15 deaths, and 360 injuries annually. The yearly national fire loss for clothes dryer fires in structures is estimated at $194 million. See a diagram of the critical danger zones of the dryer. 2) It is fun! :: And can be an outdoor experience that is meditative and community-building. It may also help you avoid depression. 1) It is truly patriotic :: Demonstrates that small steps can make a difference. You don't have to wait for the government to take action! Via Tony (Mr. Energy) Mitchell via conservect .org … Knowing that any appliance that heats something with electrical resistance (dishwasher, water heater, oven, toaster etc) is inherently inefficient, I did a few calculations for the dryer. I recorded the electric meter readings before and after using the dryer, adding the kWh used from the street to the kWh produced from the solar panels making sure everything else in the house was off or that I could account for it. 3 kWh for a 40 minutes dryer load, or 4.5 kWh per hour of use. $0.69 of Clean Energy Option electricity per load. In my house, thats $251.85 a year. If we did not get our power from renewable solar or wind from our own panels or from Community Energy or Sterling Planet, we’d pump a couple tons of greenhouse gasses into the air from the power plants just drying clothes. People are complaining about clotheslines in Brooklyn? What’s next, lamenting that there are too many cowboy hats in Dallas, or too many cows in Vermont? I know Brooklyn has experienced some serious gentrification in recent years, but it strikes me as a wee bit unrealistic for your boyfriend’s tenants to think life in Bensonhurst or any other urban neighborhood would be uncluttered by other people’s realities — and yes, that includes their underwear. As far as I can tell, and as decades of photographs seem to indicate (including those collected for an exhibit celebrating the role of clotheslines in the city), these items are such a part of life in New York that no one has ever thought to regulate them. Just to be sure, I did some digging on your behalf. We should consider clotheslines just one of the many things our forebears did right. Why? For starters, your clothes last longer if you air dry them instead of using a dryer. Clotheslines also save money and energy: Dryers are among our most energy-sucking household appliances, second only to the refrigerator. Line-drying can save an estimated $25 a month off your electric bill, says Project Laundry List, which offers a load of other reasons to hang your laundry out to dry. Yet there are still plenty of places where clotheslines are banned. And your boyfriend’s building could probably be among them, if he wanted to play the heavy: New York is not one of the 20 or so states that legally protect the “right to dry,” which means landlords and community associations can, to some extent, make their own rules. The housing official I consulted also said anything that blocks fire escapes or emergency exits can be considered a concern. I am not advocating gas or electric clothes dryers by this comment. However, I found a little on the web about using a clothes dryer without heat — which might be more ecological. One woman did note that "One of our comforters specifies air dry only. Being very light and cloud-like, it does actually dry pretty quickly without heat." Another person said regarding the "Air Dry Function on Dryer", that "Takes a while, but it will [dry clothing]. Similar in time to simply setting the item out on a rack, but there is forced airflow through the dryer." So, I think the effectiveness of using a clothes dryer without heat depends on the relative humidity of the ambient air. So on dryer days it should work better. This is Caitlin from Pearl street. My friend and I sang "On The Clothes Line" with you out on pearl street the other weekend. I was wondering when your going to post the video that we made with you?